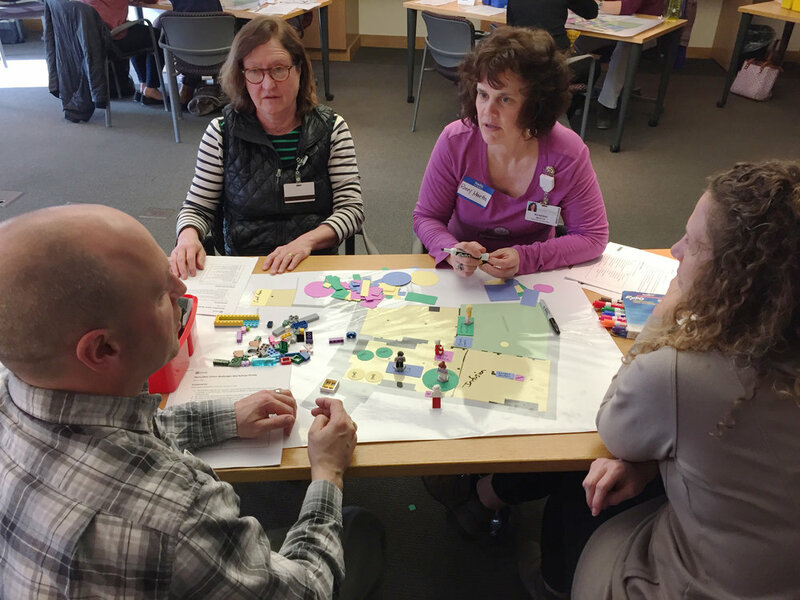 hiCOlab was invited by the UVM Cancer Center leadership to lead a participatory and creative process for redesigning the Hematology and Oncology clinic environment and service experience. Specifically, we were tasked with: providing a holistic view of the systems of care in the Hem/Onc clinic; including many different voices in the redesign process; leading a “creative journey” to redesign the space; and gathering qualitative and quantitative insights to help make evidenced-based decisions in the clinic redesign. We conducted extensive research activities with clinic stakeholders to understand the patient, family/caregiver, and staff experience in hem/onc, and to build a comprehensive view of the physical environment of the clinic and how it is used. Through interviews and observations, co-creative workshops, and a survey of research literature, we identified the most important needs of the principal users of the clinic, and then derived several key insights to frame the opportunities for redesign work. For example, we learned that patients and their caregivers feel the clinic environment is uncomfortable and does not promote healing. Patients consistently experience a lack of privacy in many areas of the clinic. From staff and providers we learned that the current configuration of the clinic space makes it difficult for them to collaborate and communicate effectively. And they do not have optimal spaces in which to work or take breaks. Our research insights helped us create a set of guiding design principles, which is a powerful design tool. Every future design decision can be checked against these principles to determine whether or not it meets the end user needs and desires we uncovered in our research.We also articulated specific design recommendations, including design features and schematic diagrams of basic spatial layout and patient/staff flows, which are organized according to these principles. We asked staff to create schematic designs of the new clinic, using the research findings and guiding design principles to help make design decisions. In the second phase of this work, we will continue to partner with Cancer Center leadership and facilities planning to work through detailed design and development through construction and implementation. Since we are steeped in the user-centered research and early engagements with hem/onc clinic stakeholders, we will help keep this knowledge top of mind. We will facilitate further stakeholder engagement, through end user feedback and additional co-creative sessions in order to extend the opportunity of meaningful participation by patients, staff, and providers. Patients and staff participated in co-creative workshops to help envision the ideal clinic environment and experience.